ECB member and Bank of France governor, Francois Villeroy de Galhau, hit the wires this morning insisting that despite sluggish inflation, the governing council is set to stick with the plan and end QE over he near term, citing September or December as the likely cut off point, and warning that the first rate hike could come quarters, not years after the end of asset purchases. 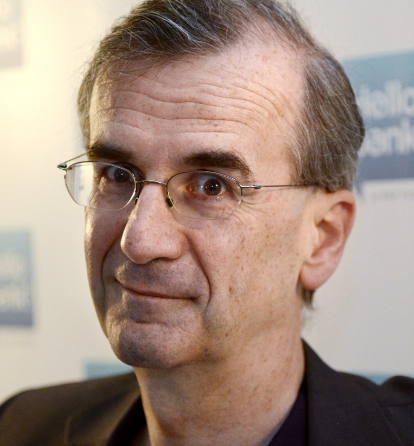 Absent some political fiasco (ahem Italy), the ECB wants to stick with the current plan of normalisation, to some degree, and on inflation alone he went on to say that the governing council view the slowdown as 'temporary' and that it expects a pick up to 'resume over coming months'. In light of this, the Bank of France governor deemed it necessary to quantify the meaning of rate hikes 'well past' the end of QE, saying that this does not mean years but rather quarters. Naturally central bankers like to maintain a level of consistency to their guidance - much like we saw with the Bank of England last week and their more optimistic take on the Q1 GDP data, and in the same way, the ECB will be loath to back down from previous assessments, with less caution required on their wording and general rhetoric now that we have seen the EUR moderate levels against the resurgent USD. 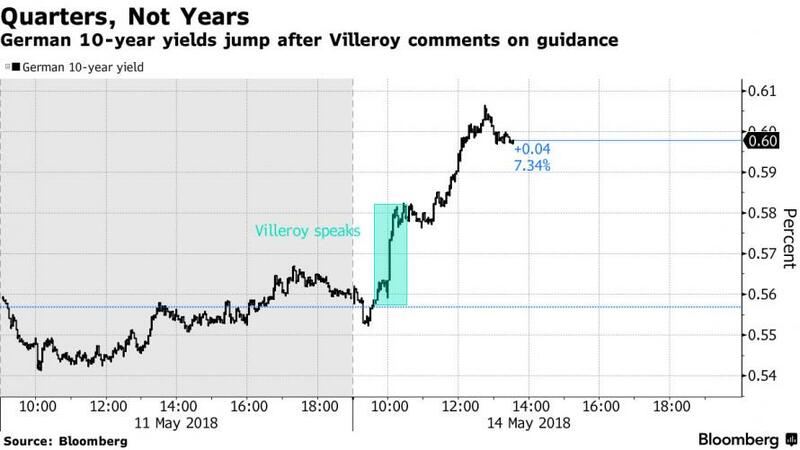 Villeroy's comments prompted a spike in the Euro, which rose to session, and one week highs, rising as much as 1.990, while 10Y bund yields similarly bounces during the speech, rising as high as 0.60% this morning. Later on this week we get the final reading of Apr CPI which is expected to remain at 1.2%, but ahead of this, on Tuesday, Q1 GDP is expected to show a 0.4% rise which should alleviate some of the concerns over damp inflation levels. Nevertheless, this is the ECB's primary mandate, and they will dance to the tune of asset price stability or not, but at least they will be less concerned over the level of the exchange rate which almost moderated to their forecast level of 1.1800 used as reference late last year. That said, in a classic case of reflexivity, the ECB is only considering pulling back on QE (and eventually hiking rates) as long as European markets are stable, which they are currently, and surprisingly so in light of the latest political developments in Italy, although the moment the ECB hints QE is over, expect turmoil and chaos to turn, because - as we have shown on several occasions in the past week - the only buys of Italian bonds in the past few years, has been the ECB. 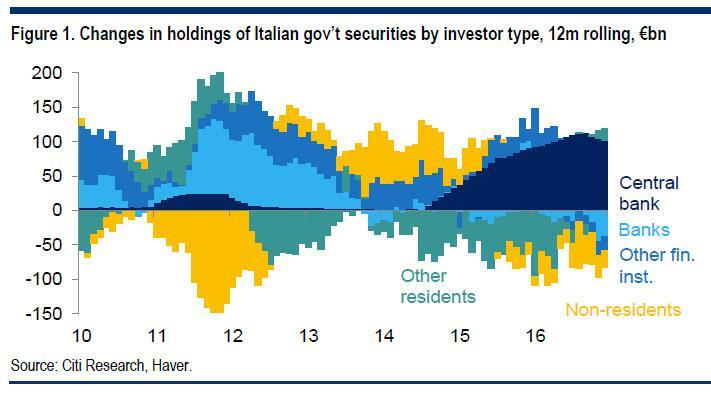 Take the ECB out and all that's left are sellers.